This is a neat documentary about how Tulips have driven people crazy throughout history. Can you imagine a single tulip bulb more expensive than your house? As I'm going to the Philadelphia International Flower Show later this week I figure I should probably brush up on my bulbs. I found this video earlier today and thought I'd share it here. This is the short version of Doug Tallamy's lecture. I know he can talk for longer and he keeps your attention just as well. He's also a magnificent bird photographer though it doesn't show that well in this particular lecture. The folks that produce The Brain Scoop have another exciting video, this time on ants. Alright so Monarch numbers are in for the year thanks to the folks over at Monarch Watch.... and they are dreadful looking. It's uncommon to see winged insects fall off a cliff, but there you have it. So with this news I've been seeing a lot of "How You Can Help The Monarch Butterfly" lists out there. One of which is from Journey North which I'd like to run through right now. #1. Plant Native Milkweed. This goes without saying. Although, the jury is still out on planting Tropical Milkweed which some say causes the migrating females to lay eggs when they should be heading to Mexico. That being said I sure see a lot of conservationists including the folks at Monarch Watch growing that species. It's a fast growing annul that's good for the spring and summer, but come August they should probably be torn down. #2 Provide Nectar Plants. I highly recommend Meadow Blazingstar, Liatris ligulistylis, and New England Asters, Symphyotrichum novae-angliae and generally any of the late flowering Goldenrod species, Solidago. On the nonnative front I've seen them on Zinnias and Mexican Sunflowers. Butterfly Bush is also a hotspot but should not be grown near wetland ares! They can shade out whole communities of carnivorous plants and orchids when they escape into the wild. #3 Avoid Pesticides.... Duh... Though to this point, a lot of people are confused on the issue of neonicotinoids. I personally believe they're safer because farmers don't have to spray every week and/or after it rains. That being said, it has been found that the pesticide does end up in the nectar and pollen more than previously thought. However, I don't think it's being used on anything that the Monarchs are feeding from, nor should it. Corn and Soy aren't exactly on top of that list. The real issue here is the fact that you can buy these chemicals at just about any hardware store. This class of pesticides is far too powerful to trust the general public and landscaping companies with. Continued in #5 below. #4 Report your Monarch Observations. There are a number of apps and social groups you can do this with. Journey North has one that covers more than just Monarchs. #5 Limit Mowing. There is a 1 to 1 ratio with number of species vs. habitat. So when you eliminate dead zones such as lawns you increase the carrying capacity of the number of species. Milkweed though is an exception because it's host more than just Monarch Butterflies. Milkweed Beetles, two types of true bugs, Oleander aphids, and if you're farther south in the US you get the Queen and Soldier Butterfly too. Not to mention they're rich with nectar. Going back to elaborate the point in #3, A big problem with carrying capacity is the use of monoculture whether it's grass in your lawn, or corn in your field. 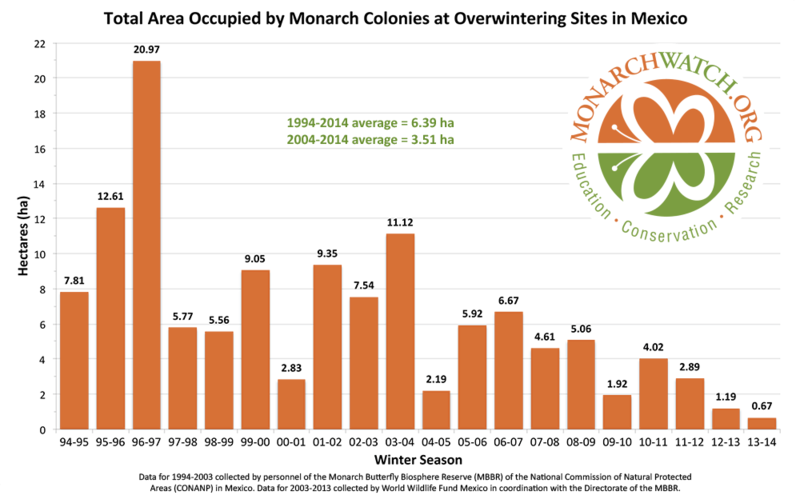 The folks at Monarch Watch keep talking about Round-Up Ready crops that eliminate common milkweed from fields... but I think the bigger issue is that they've greatly expanded the fields! Gone are the hedgerows that used to separate the property lines of family farms. Even if you were to plant nothing but milkweed eventually the parasites and diseases would eliminate most of the species the rely on that plant. Diverse communities of crops and flowering plants are best. There should be emphasis on native plants where applicable, though of course food crops don't have to be native so long as they're not invasive. But more to the point of just Not Mowing in General. Uncut lawns look awful unless they're uniformly planted with particular types of grasses and wildflowers, which your average lawn does not have. Rather than not mow, consider installing a meadow, or planting a garden. Even if you are using the store bought perennials from Asia you can buy at any nursery, you're still providing more food in the way of pollen and nectar and potentially seeds and fruit for the environment. Native plants are always best because they're 40 times more likely to host the 11,000 plus species of Lepidoptera (moths and butterflies) we have in North America. #6 Avoid Pesticides... again. They list this twice but on a community basis now. Lots of landscaping companies will use a generic "weed & feed" and other chemicals that might not be necessary. #7 Support Beneficial Farming Practices. As I said above, diversity is key. I'm not a huge fan of "organic" but more power to you if you do. A lot of crops, even when planted in diverse fields still get pests, and a lot of invasive plants and insects simply can not be controlled without chemicals. #8 Build Community Support. Get the neighbors involved... or start a blog like I did. I'm a member of the New Jersey Native Plant Society and I'm a strong advocator of pretty much everything the Mt. Cuba Center does. Chances are your state has a native plant society of its own, or space in a public library that's just itching for you to start one. #9 Contribute to Conservation Efforts. This is self explanatory.